Coinciding with the orchestra's centenary in 2018, Sony Classical is excited to announce one of the most ambitious reissue projects of recent times, a comprehensive collection of the Clevelanders recordings made under the baton of their iconic fourth music director. These span the period between 1947 a year after Szell (born in Budapest in 1897) inherited a fine provincial orchestra from Erich Leinsdorf and began transforming it into the elite ensemble it remains to this day and 1969, a year before his sudden death shocked the musical world. Szell's dream was to create an ensemble that combined the Americans purity and beauty of sound and their virtuosity of execution with the European sense of tradition, warmth of expression and sense of style, in the words of his biographer Michael Charry. That he fulfilled that dream is amply documented in the huge discography that fills Sony s new mega-box of 106 CDs, recordings that are prized for their stylistic rightness, clarity of structure, rhythmic tension, and transparency of texture (The New Yorker). Contained in this vast box are rare mono recordings, some of which have never before appeared on CD. There are also the recordings Szell made in the early 1950s as guest conductor of the New York Philharmonic, including the Tchaikovsky Piano Concerto with Vladimir Horowitz. There are the pianist George Szell's outstanding chamber music recordings, including Mozart with the Budapest Quartet. There are also substantial interviews with the maestro. 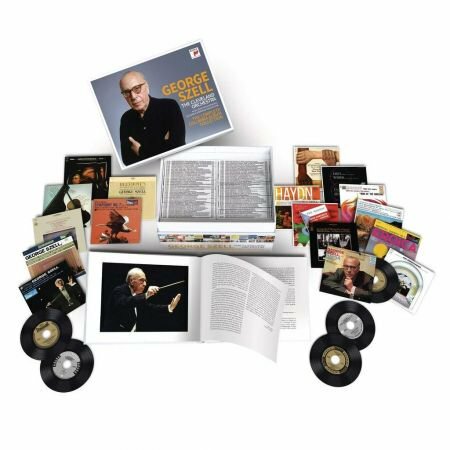 But the main attraction of this stupendous new set is the prospect of having all the Szell-Cleveland repertoire under a single roof for the first time and in optimal sound with 92 recordings remastered from the original analogue tapes using 24 bit / 192 kHz technology.